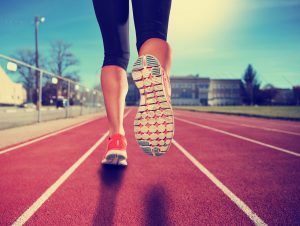 Staying physically fit in law school seems like a hopeless cause when you are overwhelmed with reading assignments, extracurriculars, and attempting to have a social life. But, it’s just as important. In fact, exercise has been proven to help memory. It does so by improving our mood and sleep, and by reducing stress and anxiety. A poor mood or sleep routine, coupled with stress, can easily lead to a compromised memory. And I don’t know about you, but when I was a law school 1L, I was chronically sleep deprived, cranky, and worried I wouldn’t remember enough on exam day. Below, I’ve outlined the four ways I found to stay physically healthy in school. It sounds so simple but walking for just fifteen minutes at a time has remarkable benefits. Besides the fact that it increases cardiovascular fitness, makes stronger bones, and reduces your risk for stroke or heart disease, walking also helps you strengthen your breath. Being able to tap into your breath during an exam, or a particularly anxiety ridden moment in school is like tapping into warp-speed when trying to get into another galaxy – it makes you feel limitless. In the moment that you are listening to your breath, nothing else matters and your brain is able to work better. If you can’t find the time to walk for a full hour each day, take walking breaks throughout the day. I used to come to school early, drop off my bag, and walk around the city for fifteen minutes. Then, after lunch, I’d go for a 20-minute walk (or however long I could spare). And in the evening, I’d try and walk again for 15-20 minutes. In doing so, I wasn’t just getting time away from the work to come back and have fresh eyes, I was also working on my breath so that when I was anxious, I could sit down and breathe in and out until I felt better. If walking isn’t your thing, find an activity that you do like. The point is to spend a certain amount of time, a certain amount of days a week, being active. That doesn’t mean you have to throw around heavy barbells seven days a week – in fact, please don’t. But getting 30 minutes of heart-pounding, dripping-sweat-at-the-end exercise sessions in 2-3 times a week will help you sleep better and have more energy for the demands of law school. During school, I cycled between at-home workouts, running, power walking, CrossFit, and powerlifting. Whatever it looked like, I took at least 30 minutes a day to do it. On the days that I woke up at 4 am (not necessary, I swear) to power lift were some of my better days in school. I had more confidence. I had a superhero feeling that was intensified each and every time I moved my body. And this confidence followed me throughout the day. I volunteered in class more because my mind was fresh and sharp – and I fully attribute that to moving my body in a way that made me happy. This is the point in the article where you go, “I know, I know My mom tells me that too.” But, eating healthy is probably the most important tip I have for you. I’ve written before about the gut-brain connection, but let me say it again: when your guts are happy, you are happy. Your brain, if it’s stressed or anxious, will send signals of that to your intestines. And your intestines, if you’ve eaten something that they don’t like, will send signals of the trouble to your brain, causing anxiety or another chemical imbalance. Eating healthy doesn’t look the same for every person, so I challenge you to figure out what does work for your gut and stay away from things that bother it. By eating healthy, you are lessening the chance that you will be anxious for no reason, encourage your brain to remember better, and have the ability to study without being distracted. After my first year of law school, I was incredibly sick and put myself on a strict elimination diet to determine which foods were causing which ailments. It was difficult, but it set me up for the next two years of school. I learned what worked and what didn’t, and this knowledge helped me ensure that I was doing all that I could to lessen the stress I felt. It also helped me sleep better, cleared up my acne, and helped me be more attentive in class. Did you know that within six months of starting law school, 40% of law students suffer from depression? And this mental state does not get better, it continues to plague them throughout school and then their career. Most law students, in an attempt to cope with the stress of law school and the amount of assignments given, use some sort of substance. In my class, many of the students were taking somebody else’s Adderall prescription, chain smoking, and then drinking at night or smoking weed to turn off the amphetamine’s effects. Taking substances outside of their prescription range, and especially taking someone else’s prescriptions, is a recipe for disaster. Substances, whether they are illegal or not, may help calm your mind in the moment, but in the long run they are attacking your physical and mental well-being. Substance abuse can cause paranoia, depression, and anxiety, never mind making you want to eat anything and everything, hurt your lungs, and make it impossible to have a working memory. It’s basically the opposite of physical fitness. I spent most of law school, putting these four tools into practice. I got up early, moved in whatever way I had chosen for the day, prepped my food, and I made it out of school a lot healthier than I went into it!